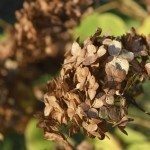 We planted our hydrangeas when it was pretty hot and now the mop heads are turning brown. Are they in shock or did we kill them? Planting is warm weather can lead to more stress in newly planted shrubs. Since the blossoms are the most outer part of the plant they may be suffering the worst as the shrub works on setting it's roots. Make sure you are watering daily to keep the soil moist but never soggy. I would trim the blossoms from the Hydrangea do help reduce it's work load. You will have to do without flowers this season, but concentrating on getting the plant established and healthy will reward you with flowering next season.